American Criminal Courts: Legal Process and Social Context is an introductory-level text that offers a comprehensive study of the legal processes that guide criminal courts and the social contexts that introduce variations in the activities of actors inside and outside the court. Specifically the text focuses upon: Legal Processes. U.S. criminal courts are constrained by several legal processes and organizational structures that determine how the courts operate and how laws are applied. This book explores how democratic processes develop the criminal law in the United States, the documents that define law (federal and state constitutions, legal codes, administrative policies), the organizational structure of courts at the federal and state levels, the overlapping authority of the appeals process, and the effect of legal processes such as precedent, jurisdiction, and the underlying legal philosophies of various types of courts. Although most texts on criminal courts do a credible job of describing legal processes, this text looks more deeply into the origins of criminal law, historic turning points in the criminal law, conditions that affect the decision-making of criminal justice practitioners, and the contentious political process that affects how criminal laws are considered. Social Contexts. The criminal courts are staffed by people who represent different perspectives, occupational pressures, and organizational goals. The text includes chapters on actors in the traditional courtroom workgroup (judges, prosecutors, and defense attorneys), as well as those outside the court who seek to influence it, including advocacy groups, media, and politicians. It is the interplay between the court legal processes and the social actors in the courtroom that makes the application of the criminal laws so fascinating. 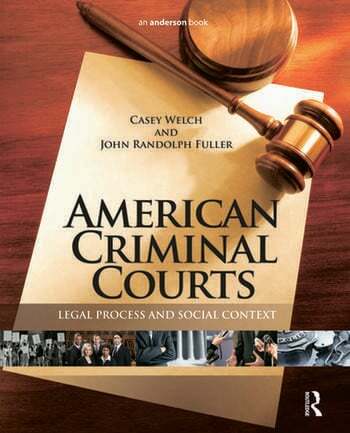 By focusing on the tension between the law (legal processes) and the actors inside and outside the courts system (social contexts), this text demonstrates how the courts are a product of "law in action," and it presents the course content in a way that enables students to understand not only the "how" of the U.S. criminal court system but also the "why." Casey Welch is an Associate Professor of Criminology and Sociology at Flagler College. He earned his Ph.D. and M.A. in Sociology from the University of Illinois at Urbana-Champaign. He earned his B.A. in Criminology and Law with a minor in Philosophy from the University of Florida. His research areas include social control, legal decision-making, homelessness, media, and pedagogy. He also works as a consultant with criminal court attorneys. John Randolph Fuller brings both an academic and an applied background to his scholarship in criminology. Fuller received his Bachelor of University Studies degree from the University of New Mexico and his Master of Science and Doctor of Philosophy degrees from the School of Criminology at Florida State University. Fuller has taught at the University of West Georgia since 1981 and has been recognized by students as a superior teacher and advisor. In 1991 he was named the College of Arts and Sciences Faculty Member of the Year, and in 2001 he was given Professor of the Year Award by the Honors College. In addition to numerous journal articles and book chapters, Fuller has published six books on topics ranging from juvenile delinquency to peacemaking criminology. He is a frequent presenter at meetings of both the American Society of Criminology and the Academy of Criminal Justice Sciences. Additionally, he serves as the Faculty Ombuds at the University of West Georgia, where he endeavors to resolve conflicts for faculty, students, and administrators.